As we do every July during the run-up to training camp, let’s take a spin around the league to ask – and attempt to correctly answer – one fantasy-relevant question of each team. Links to all divisions can be found here, and the NFC North is up next. This season, the division faces ultra top-heavy AFC East and intriguing NFC West. What is the best fantasy approach to investing in the revamped Bears? During three seasons under John Fox, the Bears ran increasingly fewer plays. They averaged 58.4 snaps per game in 2017 (second-fewest), one season after running 60.4 per game (third-fewest). They operated at the fourth slowest seconds-per-snap pace, despite consistently negative game scripts. While no team was run-heavier than the Bears in neutral situations last year (50 percent), only four teams were pass-heavier than their new head coach’s Chiefs. Before Matt Nagy took over as play-caller in Kansas City last year, they ranked 28th in plays per game (60.5). In Nagy’s first week calling plays, the Chiefs were embarrassingly handed a 38-31 road loss by the Jets, in which New York held the ball for 42:49 and ran 85 plays. Through the end of the season, however, Nagy piloted an offense averaging 68.3 plays (fifth-most) – nearly eight more snaps per game than under Andy Reid. The Chiefs also scored four more points per game (28.6 versus 24.7) with Nagy calling plays. It is no secret the Bears are in for something of an offensive awakening, with an innovative coaching staff replacing dinosaurs, just as an influx of on-field talent arrives. While the fantasy community has been quick to recognize the shift, questions remain. The degree to which Chicago’s offense thrives, who will be the main drivers of their success, and how long they will take to acclimate, are all unknowns. From the backfield, to the wideouts, to the tight ends, we have an idea of how things will shake out in Chicago – and things rarely shake out exactly how we think. As Bears continue to become more expensive in fantasy drafts, which should continue as more casual drafters enter the fray this summer, treading lightly with the pricier options and investing more often in fringe weapons may be most prudent. Chicago made their roster decisions with a high degree of confidence this offseason — which is encouraging, but also confusing when trying to pinpoint their plans. The Bears gave a hefty $42 million over three years ($25 million guaranteed) to Allen Robinson, despite a torn ACL in 2017 and a down season in 2016. Four years, $26 million ($14 million guaranteed) was a hefty price for Taylor Gabriel. They decisively moved away from Cameron Meredith. They traded up aggressively for Anthony Miller. They showered talented but lightly proven tight end Trey Burton with a four-year, $42 million contract, one offseason after spending a second-rounder on Adam Shaheen. 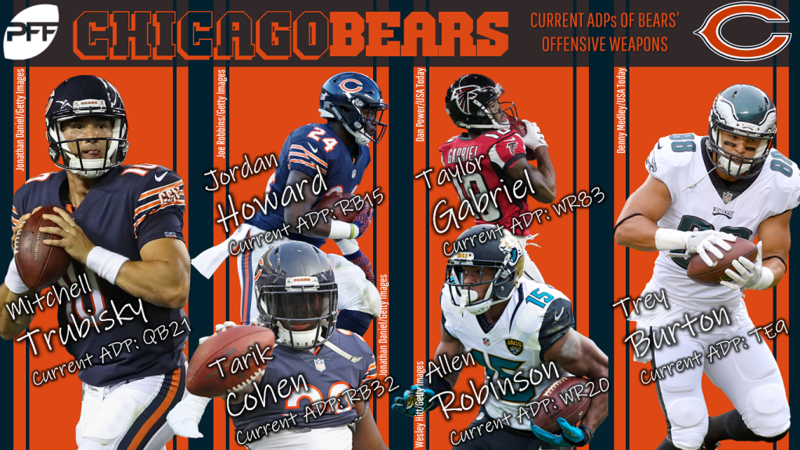 With Tarik Cohen potentially eating into Jordan Howard’s workload – and both have been talked up by the new brass – is last year’s workhorse worth his rising price? Is Robinson worth a fourth-round fantasy pick? Burton is steadily moving up draft boards, perhaps deservedly – and perhaps fueled by small-sample hopes and those longing to fill Hunter Henry’s upside-TE void. As we progress further into the draft and costs diminish, theoretical upside of players like Burton, Cohen, Miller, and even (in deep leagues) Gabriel begins to outweigh their foggy floors. It’s easier to grab cheap pieces of what many expect to be a more explosive, snap-volume-filled offense. The best way to get a foothold on the Bears escalator is via the guy who touches the ball every play — Mitchell Trubisky. Even if there’s a revolving cast of upgraded weaponry to spread it among, he’s a path to absorbing all of their fantasy goodness. We already delved into his pillow-soft schedule and suitability as an affordable fantasy quarterback pairing — but there’s a bit more. Sneakily mobile, Trubisky ranked eighth in both rushing yards and touchdowns among quarterbacks once he took over as a starter in Week 5. During his final year at North Carolina, he racked up five touchdowns and nearly 100 rushing attempts (93). If he can post similar statistics on the ground as Alex Smith did in a comparable offense, Trubisky’s fantasy floor will be well reinforced. In the high-leverage rounds of a fantasy draft, acting confident in the face of uncertainty isn’t the best idea – and the Bears offense contains equal parts optimism and uncertainty. One thing we can be certain of is Trubisky grants us low-risk exposure to the Bears’ array of new offensive toys best suited for ages 18-and-up, and John Fox-down. Which fantasy option is most at risk if the Lions’ can’t juice their low-volume offense? The Lions have a reputation as a dynamic offense in some circles. Perhaps it’s a remnant of the Calvin Johnson era. Matthew Stafford has been boosted to a low-end fantasy QB1 due to Detroit operating as one of the league’s pass-happiest teams. They finished fifth in situation-neutral pass rate in 2016, and first last season. They were also the top no-huddle offense in 2017, which looks cool on TV. The truth is the Lions have been one of the lowest-volume offenses for years, capping their overall fantasy ceiling. Last season, they ran the fifth-fewest plays per game. They ran the fourth-fewest in 2016 and have seen their plays-per-game average decrease each season since 2012. Detroit began toying with the no-huddle offense in earnest in 2016, under offensive coordinator Jim Bob Cooter. Despite giving the appearance of a fast-paced outfit – they ranked third and first in no-huddle rate the last two seasons – the Lions finished 24th and 22nd in pace on a seconds-per-snap basis the last two years. They’ve played their own brand of the Cowboys “keep-away” approach, theoretically to protect an annually overmatched defense. Despite Detroit’s slow pace and low volume, the Lions were fairly efficient last season. On a per-play basis, they ranked sixth in points (0.42) and ninth in yards (5.5). It is impossible to say if similar efficiency will remain if Detroit finally does pick up the pace, just as it’s tough to predict they will snap the ball with more urgency in 2018. The plan has worked if we consider their overall talent level — particularly on defense – versus the number of wins they’ve generated recently. New head coach Matt Patricia may not agree, but he did keep Cooter on his staff. Whether Patricia abides such an extreme pass-to-run ratio after major offseason investment on the offense line and backfield is another story. On one hand, an improved rushing attack operating behind our eighth-ranked offense line would theoretically aid overall efficiency, create more first downs, extend drives, and ultimately increase play volume. On the other, more handoffs and fewer incompletions keep the clock grinding. If the rushing attack hinders offensive efficiency – which it often does if not utilized correctly – an increase in handoff frequency can hurt the Lions from a quantity and quality standpoint. As it stands, Detroit’s most popular offseason fantasy crushes — Kerryon Johnson, Kenny Golladay, and even Luke Willson — are staring at a potential opportunity crunch. It may not totally squash their overall fantasy value, but it would hinder their consistency and predictability. Johnson in particular has much to lose from a fantasy angle. He’s the most expensive. He has proven competition for passing-downs work in Theo Riddick. He has imported competition for early-downs work in LeGarrette Blount. If Johnson doesn’t land the goal-line job, he has a cavernous floor as the rookie mired in a three-headed backfield on a pass-first offense with play volume concerns. Considering the Lions appear to have a tough schedule – they are only early favorites in four games – Johnson has an uphill battle to exceed an increasingly expensive fantasy price tag. The rookie’s risk/reward profile is hard to swallow. Are Aaron Rodgers’ pass-catchers undervalued in fantasy? We often hear how Eli Manning is too cheap relative to the fantasy cost of his main weapons. He is the 23rd quarterback drafted and has the third- and 44th-most expensive wideouts, with the seventh running back and sixth tight end catching his passes. What about the consensus first quarterback selected playing with the seventh- and 38th-priciest wideouts, the fifth tight end, and a gaggle of seventh- to ninth-round running backs? If Rodgers is going to produce statistics commensurate with his lofty draft status, either he’s going to spread it around to several unknown pass-catchers, or he has multiple underpriced weapons. Rodgers isn’t exactly known for his trust tree, and he’s dealing with very few of “his guys” this season. He may change his tune and put faith in the Packers’ handful of green wideouts, or more likely, he leans on his most familiar pass-catchers. Rodgers knows Davante Adams, who is appropriately drafted at a premium. If he stays healthy – knock on wood Adams’ recent bout with concussions are a blip and not a trend – there’s little chance he doesn’t earn his draft cost. Adams is a red-zone artist who, with Jordy Nelson’s departure, stands to enjoy both yardage and touchdown opportunity bumps. After the last two seasons, it’s hard to argue against Rodgers trusting Adams. Randall Cobb is more interesting from a rapport and cost standpoint. As the 38th receiver off the board, he has plenty of room to accrue fantasy equity. Cobb won’t turn 28 until late August, but we wouldn’t know it by his reputation. Drafters appear to be over him despite excellent production when he played with Rodgers last year. Cobb’s 30 catches, 302 yards, and two touchdowns in five full games with Rodgers works out to 8.44 fantasy points per game (14.44 in PPR formats). If Cobb sustained that over a full 16 games, he would have been last season’s fantasy WR16 (WR10 in PPR). Extrapolating a small sample of games to a full season can be dangerous, but it does give a window into what Cobb was still capable of – even with Nelson around. Jimmy Graham will mostly soak up red-zone looks, as he is no longer the between-the-20s threat of his Saints days. While he effectively returned to the field after tearing his patellar tendon in 2015, most of his athleticism didn’t return with him. Still useful, particularly in filling Nelson’s scoring-area role, Graham should return his modest draft cost even if he doesn’t immediately riff with Rodgers. Speaking of riffing with Rodgers, the running back who’s done it best is the 25-year-old “veteran” on the depth chart – Ty Montgomery. In a too-small sample of three full games played with Rodgers last season, Montgomery averaged 14.4 points per game (20.4 in PPR). Although we shouldn’t put much weight into an extrapolation, we’ll do it anyway as a frame of reference. Over a full season, that works out to the fantasy RB5 (RB3 in PPR). With Aaron Jones suspended for the first two games, and Montgomery the most tenured member of Green Bay’s three-headed backfield, it wouldn’t be shocking to see him get off to a hot start. Hot hands tend to get more playing time, something Montgomery had in spades before injuries took their toll. He had snap rates of 90, 86, and 94percent in his three full games with Rodgers. Jones’ suspension has placed more focus on Montgomery’s ultra-affordable fantasy cost. Yet, it hasn’t risen to a prohibitive point (42nd RB), and with the Packers light on proven receivers, even if the former wideout doesn’t garner a ton of carries, he can pay off in the passing game. The chances he’s involved enough to thrive are worth trusting. Do the Vikings have fantasy’s most undervalued running back? The Vikings threw the 11th-fewest passes and had the second-most handoffs last season. Continually favorable game scripts were the top driver of their rushing volume, but they ranked as the 10th-most run-heavy offense even in neutral situations (game within one score). Minnesota will probably pass at a somewhat higher rate in 2018. They are early favorites in 11 of their games, after tying for a league-leading 13 wins in 2017. The Vikings face several top teams, including the Eagles, Rams, and Patriots on the road, the Saints at home, and two games with the Packers. Also, they guaranteed $84 million to a new quarterback. Kirk Cousins has plenty of weapons, but none are drafted earlier in fantasy leagues than Dalvin Cook. Spending a pick at the first-round turn on a running back who was often hurt in college and is coming off of a rookie-year ACL tear, is showing major injury agnosticism. While the fantasy community almost certainly puts too much weight on “injury-prone” labels, it doesn’t matter what we think. It matters what Vikings coaches believe. They dictate the snaps and touches we fantasy geeks need like air. Will Cook see less work than he was pacing for before his non-contact knee tear occurred halfway into his fourth professional game? At the time, he had 74 handoffs and 15 targets on 169 snaps. The rookie was on a 338-carry, 69-target, 773-snap pace. That would have ranked first, ninth, and fourth among running backs, respectively, for the full season. With an entirely unproven depth chart behind Cook and Latavius Murray, will the Vikings shovel the same heavy workload on the sophomore runner’s back? The bet here is Murray takes on a sizeable chunk of early-downs carries, and Cook assumes a larger passing game role – which, fortunately, is more valuable for fantasy. Jerick McKinnon vacated 61 running back targets when he left for San Francisco, the majority of which are likely going to Cook. How McKinnon’s 150 unaccounted-for handoffs are split between the only two Vikings running backs of consequence is a larger question. Former Eagles quarterbacks coach John DeFilippo is Minnesota’s new offensive coordinator. While there’s no guarantee he doesn’t mold his scheme to fit personnel – as sharp coaches do – DeFilippo was part of a wildly successful offense with a committee backfield. This doesn’t mean Cook, Murray, and Mack Brown are all going to be shuttling on and off the field every drive, but it should make us question if Cook is going to be ridden hard and put away wet, as he was the first three-plus games of 2017. Murray stands out as particularly undervalued in fantasy drafts as the 50th running back selected, usually in the 12th round. There’s a chance he’s the goal-line back in a high-octane offense. He filled in admirably for Cook last season – earning a career-best rushing grade – and is the only Vikings running back with legitimate NFL experience. While Murray projects for standalone value, and thus is a fine later-round pick in best-ball formats, his value would erupt with another injury to Cook. For folks who are still into things like this, Murray is a prime “Zero RB” candidate.